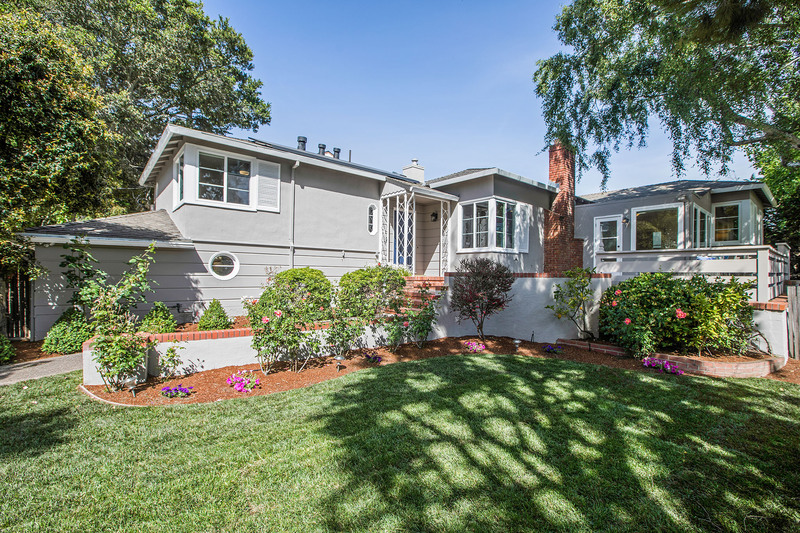 Enjoy modern comforts with the enduring classic charm of a circa 1940 home in the sought-after Burlingame hills. The thoroughly upgraded interiors blend seamlessly with the home’s original fine craftsmanship and aesthetic appeal. The result is a stylish ambiance that respectfully preserves the home’s vintage character while accommodating everything needed for today’s lifestyle, including a stunning chef’s kitchen, sunroom for everyday living, and even solar-powered electricity and an EV charger. Fine hardwood floors, crown moldings, and lighted ceiling fans are classic and timeless. The extra-large living room at the heart of the home is complemented by a formal dining room, but it is the gourmet kitchen that is the true focal point of the home. Custom cabinetry, Calacatta marble, and a butcher block island that doubles as a casual dining area are just some of its many features. Plus, stainless steel appliances ready for the most demanding chef and all beneath a towering skylight that enhances the atmosphere. The home’s 3 bedrooms include two with en suite bath, each remodeled with luxurious finishes. Excellent storage space, an attached 2-car garage, and private front and rear yards for play, along with a sun-swept front patio sheltered from the street, are the finishing touches. With an enchanting heritage and stylish ambiance, this enviable home also benefits from miles of hiking trails at Mills Canyon Park just down the street, close proximity to shopping and dining in downtown Burlingame, plus access to top-rated local schools and nearby world-class healthcare and commuter routes to San Francisco and Silicon Valley.